We are really excited to announce our collaboration with artist Kevin Day to celebrate the 25th anniversary of Aston Workshop. 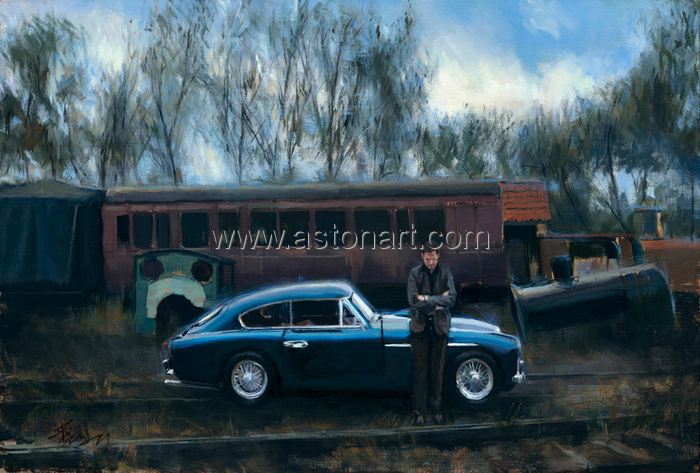 Kevin's work can best be described as figurative narrative and he is renowned for capturing the mood of the moment, a style which we believe adds a whole new dimension to the world of Aston Martin art. Whilst the cars undoubtedly figure prominently in each painting, they are not the only point of interest and your eye is quickly drawn to the exquisite detail of the painting as a whole and the narrative reaches far beyond that of normal automotive art. The result is a series of paintings featuring Aston Martin cars with a completely new slant. Make no mistake, this is a major series of paintings and it's a real pleasure for Aston workshop to be involved in something as fresh and exciting. A series of 20 paintings will include classic and modern models from the early pre-war cars through to the famous DB4, DB5, & DB6 and onto the modern super-car era. As each painting is finished it will be added to Aston Art where they will be available as limited edition prints. The series is expected to be completed by spring of 2014 and we shall be holding an exhibition here at Aston Workshop with a private viewing by invitation only, dates to be announced in the Living Legend newsletter closer to the time. The limited edition ’On the Tracks’, signed by the artist.